Internationally-acclaimed cellist Igor Gefter joined the Toronto Symphony Orchestra in 2006. Prior to his move to Toronto, Mr. Gefter has performed with the New York Philharmonic, Chicago Symphony, Boston Symphony, Detroit Symphony and Seattle Symphony. An active teacher, Igor has held a private studio since 1992. While still a student at Juilliard, he served as a teacher’s assistant at the Juilliard College division as well as an orchestra and chamber music coach at the Pre-College division. In Toronto, Mr. Gefter has already established himself as a prominent cello teacher. His students regularly win top prizes at the competitions and receive top marks in the RCM exams. Mr. Gefters numerous honors include numerous Chalmers Performing Arts Awards from the Ontario Arts Council as well as four consecutive B-Grants from the Canada Council to study abroad. In 1997, Igor was a Recipient of John B.C. Watkins Fellowship from The Canada Council. In 1991, Mr. Gefter won first prize in the Canadian Music Competition, which resulted in numerous recitals throughout Canada. While studying in New York, Igor won the Mannes Concerto Competition and performed as a soloist at Lincoln Center’s Alice Tully Hall. 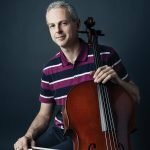 An active participant in international music festivals, Mr. Gefter serves as principal cellist for the Grand Teton Music Festival in Wyoming every summer. In the past, he has served as principal cellist for the “Festival of the Two Worlds” in Spoleto, Italy, the International Chamber Music Festival in Venezuela and the International Symphony Orchestra in Israel. He has been a principal cellist of the Juilliard Orchestra on numerous occasions and has performed many times with the New York City Ballet Orchestra. Igor holds Bachelor and Master of Music degrees from The Juilliard School, where he studied with Harvey Shapiro and Aldo Parisot. He completed his post-graduate studies in the studio of Carter Brey.